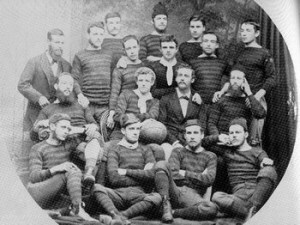 The first ever football match in Queensland conducted by the Brisbane Football Club took place over two weekends on Saturday July 21, and July 28, 1866. The match was between the members of the Brisbane Football Club who were civil servants against the rest of the members and was played under the Melbourne rules. The only other match to take place in that first season was between Brisbane Football Club members who were Australian-born against those born elsewhere. Early matches (1866-1869) were predominantly conducted under the auspices of the Brisbane Football Club as there was no formal league. So Brisbane would play one-off challenge matches against various establishments such as Volunteer Artillery, Queen’s Own 50th Regiment, Police, Athletic Club, and the National Cricket Club. There were no other football clubs until Ipswich formed in 1870. Victorian football at that time, like Brisbane, and Ipswich, had no fixed calendar of matches. Clubs were free to challenge one another, and to arrange between themselves the time, place, and duration of play and the size of teams. The early games were commonly played between twenty-five men of each club; later, twenty a side became the established rule. The club dabbled in some rugby games in the late 1870s but soon returned to the Melbourne Rules. By 1880 there were 4 senior clubs with the Brisbane club playing Ipswich, Wallaroos and Excelsiors. By 1883 the Queensland Football Association was formed with many clubs having two teams and new clubs included Rovers, Grammars and Barrambin. Brisbane Football Club was to follow the Australian game, only to fold in 1886, fours years before it disappeared from Queensland for almost 15 years to reemerge in 1904. Brisbane Courier reported that the Brisbane club travelled by train to Goodna, to play the inmates and staff of the Woogaroo Asylum. Dr Webb captained the asylum and several warders and inmates joined him. The report of the match indicates that it was a vigorous affair played in earnest.